This chapter aims to give a brief overview on the complexity that is typical of hand motor control studies. 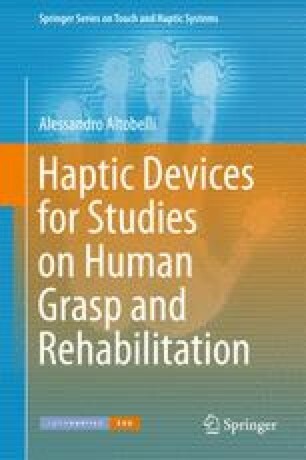 Starting from biomechanical hand models to recent theories on motor control in grasping tasks, in this dissertation the important factors which affect grasp proprieties are dealt. The mechanical structure of human hand is extremely complex and difficult to model; its rigid internal framework is made by 27 bones that are moved by 18 intrinsic muscles and 18 extrinsic muscles coupled by a network of tendons. To have a simple hand model, at least 23–24 DoFs are needed: 4 DoFs for each finger, 5 for the thumb, 1 for the radioulnar joint, and 2 at the wrist. In a more detailed model, the number of DoFs increases just taking into account the hand’s capability to create a palmar arch when it closes. A complete biomechanical model includes 36 muscles coupled to the bones by a complex tendons network; moreover, several biomechanical constraints have to be included in the model. Joint limits or finger dimensions are clear examples of constraints which can affect the interaction of the hand with the world, and additional constraints arise from the coupling of tendons and muscles. Some muscles span several phalanges, making it difficult to move only one joint independently; for example, the flexor digitorum superficialis (FDS) and extensor digitorum communis (EDC) muscles are divided on each finger; therefore, a contraction of these muscles engages several hand joints. Understanding how humans exploit biomechanics and sensory feedback of hand in everyday tasks is a challenging topic that still is not completely understood. Several studies and theories, focused on kinematic and grasping tasks have been developed. In the next section, I will give an introduction on the most recent studies which focus on important aspects of manipulation: (i) hand control in pre-grasp phase, (ii) grasp force distributions, (iii) muscle activations, and (iv) impedance control.